This is hardest part of the season, there are only a few more weekends of racing left and the long weekends are starting to take their toll on us. Add to that, school has started causing our focus to start to wander a bit. So far, Jason has locked up 2nd place in his LO206 Sportsman in Mid-American Sprint Series and the Briggs 206 Cup. With one race left in each series the Championship is still on line in the Championship Enduro Series and Briggs 206 Cup Animal Class, so we need to stay on task to do well in these last weekends. For the last four years Jason drove karts that are build for smaller drivers. It’s made with smaller tubes and has more flex to help the light weight driver for better grip and handling. Jason has been growing all season we have had to move the pedals twice and change out a seat on one kart. His growth is starting to affect the karts drivability. A few weeks ago we purchased a “new to us” kart for the Animal class, a 2005 Coyote LE from Robert Murray Racing. We have just a couple of weeks to get the kart tuned up and ready to attempt to finish with some wins. 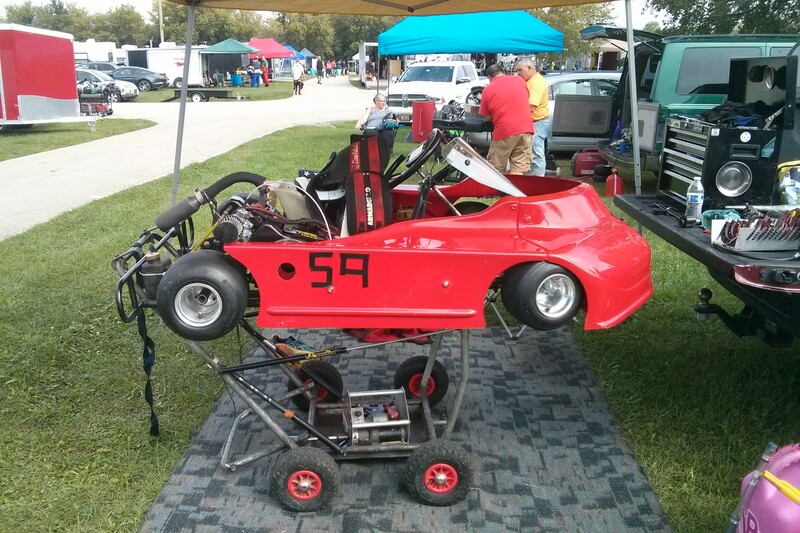 Initially, we had just planned to race at Badger Kart Club on Sunday to give the new kart a shake down, but, about 10 am on Saturday the plans changed. I made a comment to Jason about getting in on the night race and Concept Haulers Motor Speedway he was all on board with that. So we spent the next 2 1/2 hours getting both karts ready. We staged the Animal for a Sunday morning load and then tossed the 206 and tools, in the back of the pickup and headed out to Norway for a 4:30 pm practice. He have not done a two track weekend since the kid kart days. It’s lots of fun but takes some perseverance to pull off. Our expectations for the night race where high, I tried to keep things on a even keel, its important to not get a full head. 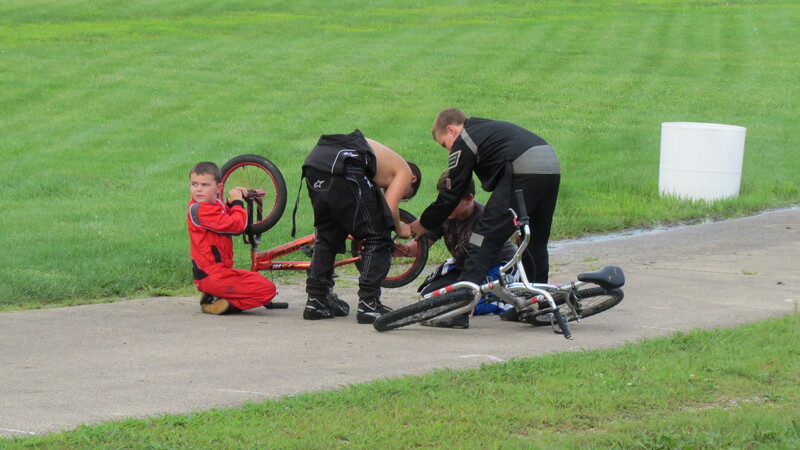 Jason had always done well against the local kids at Concept Haulers, but we also knew they had been getting faster. Jason started every practice session in the back and was able to work his way up to 2nd or 3rd by the end. His passing was getting a bit aggressive and pressing other drivers to let him by, but he still kept it clean. The random draw for the first heat started him in second for the first heat and finished there, the fast local driver was seconds ahead by the end. He started 6th for the second heat and was up to 4th with in a few laps but was unable to make moves on slightly off line and but just a hair slower traffic. Jason started in second the feature, he dropped back to third and then was passed in the back stretch for 4th but gained it back in a really great pass as he exited the hair pin. Seven laps in with 5 to go, he was working on 2nd place as he exited turn three but closed the gap to fast and had to break hard on the causing the 4th place kart to bang in to his rear and sending him spinning into the grass and ending his race. Our ride home was quiet but we learned some new tricks, some of it what not to do. At home we unpacked the kart and headed to bed for a few hours sleep before more racing the next day. 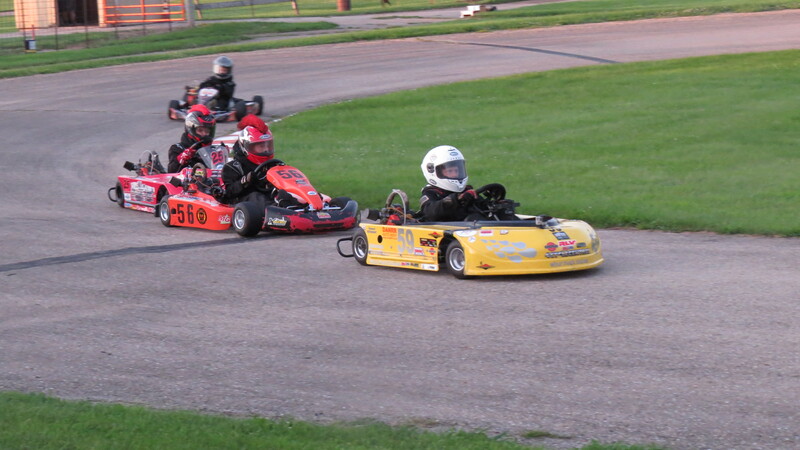 Up early on Sunday, we loaded up spare set of tires and the new kart in to the truck and headed to Badger Kart Club . There was quite a large crowd for their last race as number of championships were still in dispute including in the Animal Junior class. 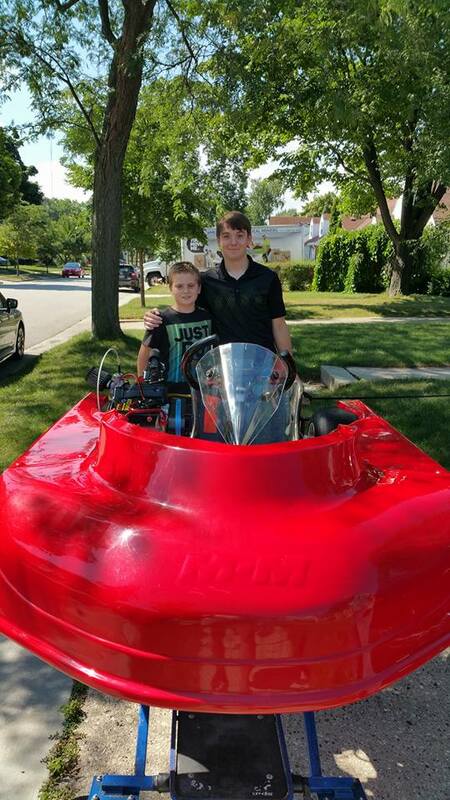 Our goal was to stay out their way and learn to tune the kart and have some fun. Practice was awful, with cold and slick tires he spun off the track in the third turn, the kart was way too loose for his driving style. I tried to make adjustments to the wheels to fix the problem but to no avail, the kart was still driving him. We finally removed the wide squished wheels and tires and put on the newer, skinnier, and taller set for the feature and he was able to get the kart under control but the gearing was off by a half dozen teeth so he lacked top speed. Despite finishing 6th of 7 it was a good day of testing, we were both pleased with the results and the knowledge and experience gained. This should bode well for the critical last few races. The next race will be after the weekend after Labor day. It is the last road race of the season and Jason is in second place with a good chance of winning the Championship he just needs to finish in front of the class leader in all four races. He can do this, hopefully we will be able to keep the kart in shape. Thanks to Robert, Marty and Kat Murray for the help all season long and getting the new kart ready for us. Thanks to my parents who came out to the Concept Haulers race to cheer Jason. Good Luck to Katie and Karen this weekend at the Walworth County Fair this is one of our favorite non-karting weekends of the summer. We get to watch Katie ride and hang out at the fair all weekend.